What do I get if I rehome a pet? Need help rehoming your pet? Published 25th January 2019 at 272 × 400 in Dogs Looking for Homes. 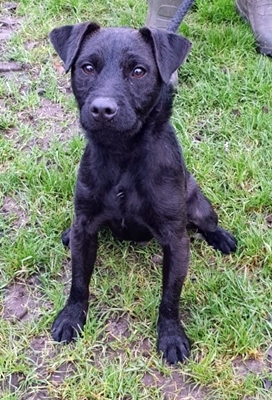 GONE TO RESCUE, RESCUE REMEDIES 2/4/19 ‘Rocky’ 11 month old Castrated Male Patterdale Terrier. Rocky came into us for rehoming as he was too much for his owners. Rocky needs a lot of exercise and an owner with patience but also who has lots of time as he does need training. Rocky doesn’t like other animals so will need to be an only pet. He isn’t keen on being over handled so cannot be rehomed with anyone under 14. He has been adopted but returned as he was a nuisance with other animals when out on walks, despite this information being given to the adopter – PLEASE NOTE that he will need to be kept away from other animals and exercised at quiet times/in places where other dog walkers don’t frequent.